The course is designed to help you understand how to clear Group Discussions, a vital aspect of an interview procedure. It enables you to have an overall view of the process, through various scenarios presented within the course. The whole learning arena, from the introduction to common mistakes, is presented in one course. 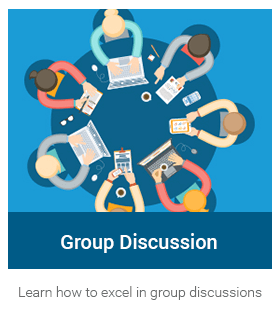 This course will enabele you to crack a group discussion in just 4 exciting levels. The aim is to understand what are Group Discussions and its importance. How it is used as a tool to measure potential candidates and assess leadership qualities. It also demonstrates problem solving abilities and group dynamics. Learn and understand the direct skills and hygiene (environmental) factors involved in a group discussion. Motifs/pictures and few practice exercises will help you with your learning. Also learn phrases that help you with your discussion. Learn how to prepare, present and interact in a group discussion. Various real time scenarios, examples and questions helps you learn better. Learn and understand the types of topics of group discussion and how to handle each of them tactfully. Exercises and fun facts help you boost your learning.